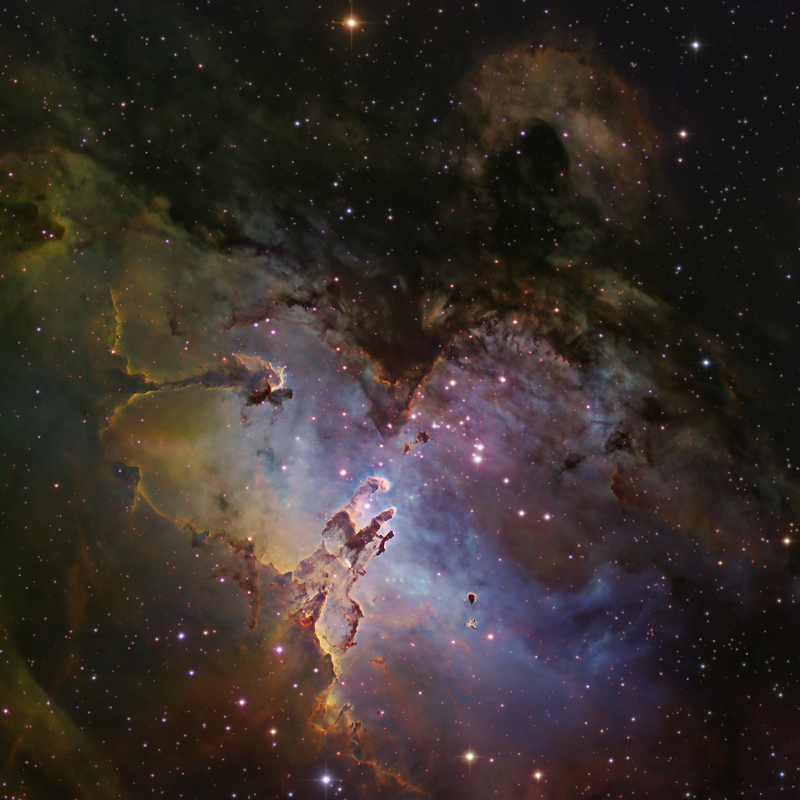 M16, The Eagle Nebula, in the constellation of Serpens is about 7,000 light years distant. �North is up and East left in the image.� �It is a young open cluster of stars estimated to be 1-2 million years old containing in excess of 8000 stars. The nebula is part of a diffuse emission nebula, or HII region, referred to as IC4703, and is estimated to be 5.5 million years old. The large, horizontal spire at the middle left of the image is 9.5 light years long (90 trillion kilometers).� To place that distance into perspective, Pluto is a mere 0.0006 light years from our Sun, and it took New Horizons 9.5 years traveling at 58,000km/hr to reach it! So, for New Horizons to reach M16, it would take about 150,000 years.� There is nothing that can prepare the human mind to comprehend such distances.� The spire coming from the southeast into the center of the nebula was the focus of the most popular and enigmatic astrophotograph ever taken from the Hubble Space Telescope back in 1995, entitled �The Pillars of Creation�.� Their columnar shapes are due to intense ultraviolet radiation emanating from young, hot stars outside the image that burn off the gas and sculpt them into pillars.� Chandra X-Ray Space Telescope peered into the pillars and did not find evidence for the expected number of new stars forming, suggesting that star formation in the pillars is coming to an end.� This image was processed similarly to the “Pillars of Creation”.� Sulfur (SII), hydrogen (H-a) and oxygen (OIII) emissions were color-mapped to red, green and blue, respectively.� Brief data from red, green and blue filters (RGB) were used for star colors.